As we all know avocados and chocolate are both good for you. Avocado with its healthy fat and chocolate its antioxidants. Although the combination seems a little unusual it actually works well together to make a really thick and rich chocolatey frosting. Additionally, this is a great way to add a healthy fat and frosting to a dessert. 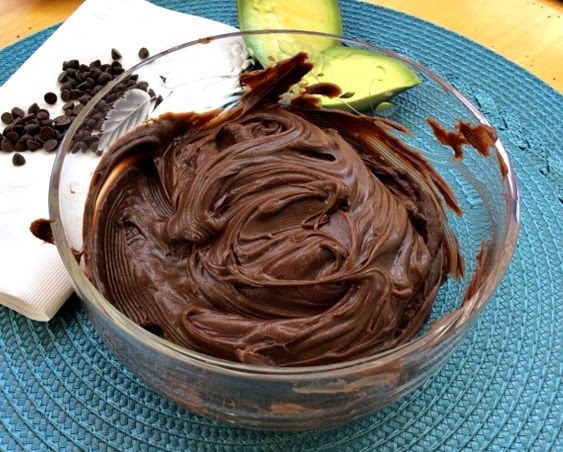 This recipe for CHOCOLATE AVOCADO FROSTING is so simple and easy to make! You just throw a few ingredients in a food processor and presto you have an amazingly sinful and decadent chocolate frosting! You will absolutely love this! Recipe: Makes enough frosting for one single layer cake. 1/2 cup good unsweetened cocoa powder Note: I used "HERSHEY'S COCOA" Natural Unsweetened (100% Cacao). Place all the ingredients in a food processor and mix together, stopping to scrape down the sides once or twice. Stir in the chocolate chips, if desired. The frosting is ready to spread immediately but you can refrigerate it if you think it needs to firm up. Add a little water if it is too thick. I've made avocado pudding before, but your frosting looks wonderful! I pinned it to try soon! I've tried a different avocado frosting recipe. It stayed very soft and was kind of messy on a cake. Does yours firm up any? Yes, in fact this recipe does produce a frosting that does firm up, especially after a little time in the refrigerator. Hope that helps! YUM! I would maybe ditch the maple syrup, or find a sugar-free one and go for Stevia or Monk Fruit Extract. Enjoy and let us know how your sugar sub works out! Thanks for sharing another tasty recipe at Motivation Monday! Thanks for linking up at our Gluten Free Fridays party! I have tweeted and pinned your entry to our Gluten Free Fridays board on Pinterest! :) I can't wait to see what you share this week! Its LIVE! Looks delicious, Lovely chocolate avocado frosting. thanks for sharing with Hearth and soul blog hop, pinning. tweeting and sharing in google plus.